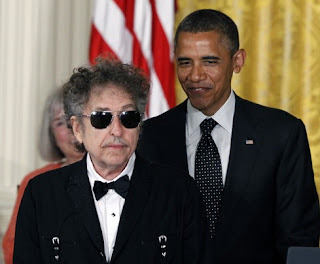 music ruined my life: Bob Dylan: "It's Going to be a Landslide!" When I did a post that invoked Bob Dylan, as a brief aside, in my post about music and politics (see HERE)*, I received an avalanche of negative feedback, with one reader even going so far as to imply Dylan had become a birther! 'But he didn't say he was voting for Obama!" the Right Wing Bobbers will howl. These, of course, are the same people who tried to downplay his unusually direct praise for Obama in '08! However we parse his words, it seems plain that Dylan's true devotion is to his work and that politics are merely an aside. * A couple of the comments are priceless and worth perusing! Well Mr. D was right, I thought so too based on sources other than our so called media witch I made a New Years resolution not to watch during this election year. Personally I'm more thrilled about the three women I supported because they all won !!! I wish our country the best and line up behind the winner. I did not vote for him but I am not going to tear him down either. That is certainly more sympathetic that the other side has been to my side. He has not had the best four years to deal with and hopefully he can gets things more on track. We are still going in the wrong direction. And Congress, get some balls and try and work together, both parties. "And Congress, get some balls and try and work together, both parties." That a tough but damn fitting conclusion to take from all this!